Wow can you believe it its been 2 years today that this blog has been running?It has been an amazing 2 years of sharing Speedy with you all so thank you all who follow us thought Blogger ,wordpress,google+ ,email and now instagram,you are all amazing too!We have made such a lot of friends this past 2 years and this constantly amazes me that so many of you could fall in love with one cute cheeky little Bunny named Speedy when you all have cute lovely pets of your own to love. A few weeks ago a new follower nominated us for "Best other Blog" at the Blogpaws Nose to Nose awards and I never thought for any instant the we would win or even be considered to be among the finalists, well last night I had an email from Blogpaws telling us that we are a Finalist and today I went on their site to see who else made the grade and was amazed to see we are one of 4 finalist with our Friends from "Hutch a Good life" and "My Mini Pet Pig" the other finalist is "Horse VA".We are truly humbled and honoured by this news and the saddened a little too as I so want to go to Blogpaws and I can't as the cost to travel from the UK to Las Vegas where Blogpaws is being held is out of my reach so I need some body who is going to Blogpaws to represent me and my Boy Speedy...so any of you feel up for the Job?The Job of representing that Cheekiest of Rabbits may be the cheekiest in the world ,certainly one of the cheekiest at any rate...So are any of you up for that special responsibility of Representing Sir Speedy The Cheeky House Bunny,Pirate and Buccaneer and Captain of the SS Speedy and Knight of the Realm of Speedom? Concatulations, Speedy! My human is going to BlogPaws but she is leaving Saturday night. I am sure somebody will step up and accept the award for you - you have so many friends here! Paws crossed that you win! We agree with Austin and a big round of applause at turning 2 on your blog and for the awesome nomination. Have a serene Sunday Speedy and get in some big easy today. OOOO!!!!!!!!!!!!!! 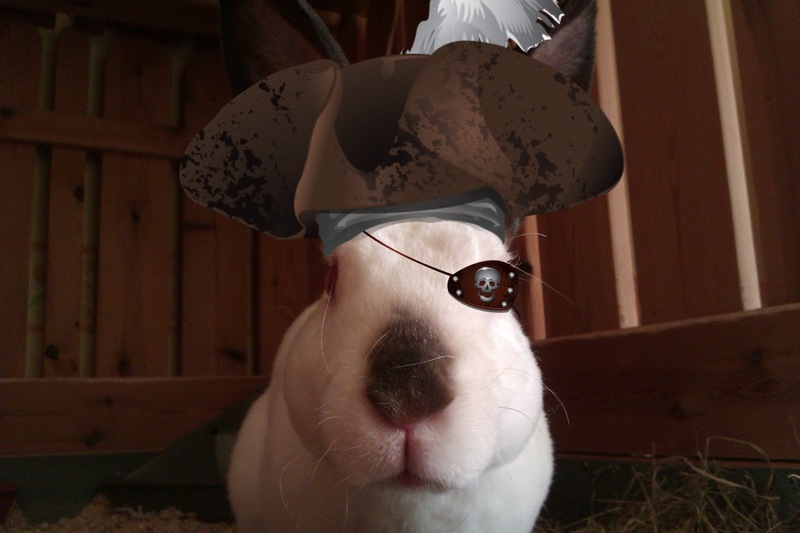 If I could Oh Captain My Captain, I'd get me a pet rabbit and go for yer....argh! How can anyone resist (OR DARE TO) that face!!!! This is the cheekiest of pirates INDEED! Oh how fun it would be for your Speed-o-meter, to go to LAS VEGAS! Mummy could win some cash and you could see the lights and sights and get a feel for the desert sun. I congratulate you on your SECOND year of blogging! It has been a huge highlight in my career change and friendships...and you have been a great chum....my chubby little speedy bunny. I just love that POSTER SHOT of the most notorious but of the CUTEST pirate on the high seas....Oh you two, thank you for coming to visit my post! LOVE!!!!!!!! Happy, happy 2nd blogoversary, Speedy! I'm so happy for you for being a finalist for the Nose to Nose awards! We're very glad to be your friends! Happy 2nd Blogoversary Speedy! Big congratulations on being one of the four Blogpaws finalists. Oh! Oh! Speedy, if wes was going wes would takes flat SPEEDY butwes NOT going. Me is sure somebody will helps and NOW mes going to sing yous the Happy Blogoversary song!!! Ah wow! Thats so great that your a finalist!!!!! I remember asking you for all your info when I nominated you, and now look! You are a finalist!!!!! WOW!!!! So super proud of you!!!!!! I certainly hope you find someone to represent you at blog paws!!!! if I was going I would stand for you!!!! However the cost from Canada is far to much for me to afford going as well. Otherwise I would be there! So happy for you though Speedy! And wishing you a very happy Blogoversary!!!!!! Happy blogoversary Speedy, and congratulation for your nomination. To your "Môman" too. I am sure that you will find somebody to represent you to Blogpaws. You are such a nice Cheeky Rabbit, and your blog is ..... we love it ! Happy Blogoversary Speedy! We are so happy that you are nominated…we love your blog! Sure wish we were going to see you at BlogPaws. We were pretty excited that we were nominated. So many wonderful bloggers out there who are awesome pet parents and helping animals! CONGRATULATIONS! Bein' a finalist is SO exciting. Well done, my friend. Well none. Congrats to be a finalist. Very exciting. Have a nice day. Huge congratulations on your blogoversary and BlogPaws nom. I will be speaking at BlogPaws and wonder kind of representation you require? Massive congrats Speedy,. both for your bloggyversary and for being a fianlist - amazing! Yow yow Speedy conkatulashunz on bloggin fer 2 yeerz here!! We iz so thrilled we made furendz wif ya! Yer Mum n mine like to meow on da tellyphone n it iz lubly to hab such guud furendz over da Grrreat Pond! Conkatz on da nommie-nashun too!! We hopez sumone can repreesent ya at da Bloggie Pawz n bring home yer award fer shure!!! Once again congratulations Speedy!!!! I am sure you will find someone to represent you! Be sure you tell BlogPaws (if you haven't already) that you can't go, so that they may give your registration to someone else. I sure wish you could go. I am sooo wanting to meet you! Congrats and Happy 2nd Bloggerversary. Happy Blogoversary Speedy!!! Big congrats on the BlogPaws nomination, that is truly wonderful. We're not going this year either but hopefully Layla can help you out pal. We are so proud of you! Happy Blogoversary, Speedy! And congrats on your BlogPaws nomination. The mom is going to BlogPaws. She's sorry she won't meet your mom. Happy Blogiversary and a HUGE congratulations! I know someone nominated me for this category, but didn't think I'd be a finalist since I am not *just* other pets. I so want to go to! Right now, I am pretty sure that I won't be there though. Speedy what a fabulous honor!!! Concatulations my friend.....and if my Mom was going to Blogpaws this year she'd certainly happily represent you BUT she's not going I'm afraid.....it's a bit too expensive for her BUTTTTT I have a feeling that some of your blog followers who are planning to go would LOVE to represent you!!! Good luck!!! Also, HAPPY BLOGAVERSARY to you - you've got so much to celebrate. And you are one of the best things to come along in blogdom in a long time, Speedy! Time flies by sooooooooooooo fast! I'm really happy that blogging has brought us together. I love you both so very much! Congratulations on your award. You both deserve it. Wish I was going to Vegas, I would represent you for sure. Happy anniversary! Not sure if my comment went through for your approval. If so, I'll just say again, happy anniversary! Love you both so very much! This is amazing Speedy! Job well done my friend! A slightly late congratulations - I do hope you had a pawty! !